Most people don’t start out to rescue animals. We grow up with animal friends & appreciate their beauty, intelligence & companionship. Along life’s path we probably saw animals that weren’t appreciated, that were neglected or mistreated. Maybe at the time our thoughts were, “someone should do something about that”. I know when I was a girl there was an old bay mare down the road I use to visit on a regular basis. She could hardly walk. She had been foundered, (as I know now) and her feet were as long as they could be without curling. She stood in the pasture day & night, winter & summer, thru snow & rain, on those horrible feet, year after year. I enjoyed feeding her apples & pulling grass to feed her, when she could hobble over to the fence, & as a child never questioned her lifestyle. I now know that her life could have been much more comfortable, if someone had just trimmed her feet & kept them trimmed. She also would have benefited from having a shelter to go in. I don’t know if the people fed her anything other than the small pasture she was in, I don’t remember her being thin, so assume she was adequately fed. Hers was a life of neglect, the boy of the family was grown & although I don’t know for sure, would imagine she had been his horse. I don’t know what happened to her ultimately. I grew up, went on with my life, & when I went back to visit, the pasture had become a subdivision, & the old house was torn down to make way for more houses. 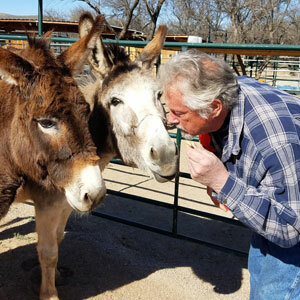 Forever Home Donkey Rescue & Sanctuary began in 1997, although at the time we didn’t know it. My husband John saw an ad in the paper for a $50. 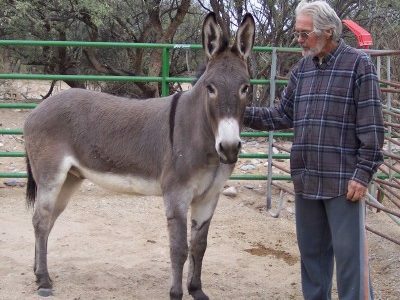 donkey & asked if I’d like a donkey for my birthday. We made arrangements to go see him. BlackJack was a 10 year old intact jack & no one else had answered the ad. The man said if we didn’t take him, he’d send him to slaughter. Of course we took him, didn’t have a trailer, didn’t have any idea of what we were getting ourselves into, but we had “saved” him. Our relationship & learning curve was pretty rocky, until we had him gelded. 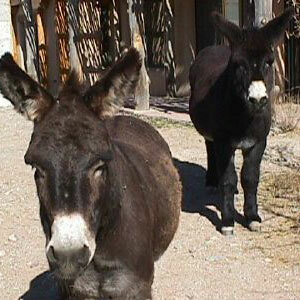 Not wanting to have a solitary donkey, we answered an ad in the paper & bought him a friend. What we didn’t know at the time, Cisco, had horrible skin condition caused by habronema larvae, & within 7 months we had to have him euthanized. He had destroyed his sheath by biting, because of the intense itching. BlackJack was alone again, so we put an ad in the paper to find a donkey. We brought 2 home the same day, one with emotional problems, very distrustful & spooky & another one with habronema larvae that needed daily & sometimes minute by minute attention over the next few months. 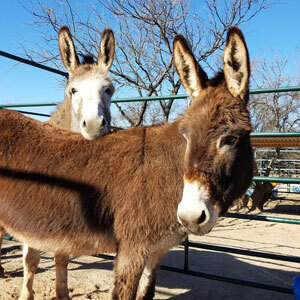 The next few, showed up as donkeys that needed a home, & had mental or physical problems. 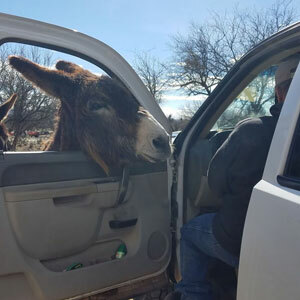 Somewhere along the line we noticed we were getting donkeys that had no chance at a “normal” home, for one reason or another. That’s when we realized we were a home for donkeys that had absolutely no place else to go, & would probably stay here for the rest of their lives, hence the name, Forever Home. 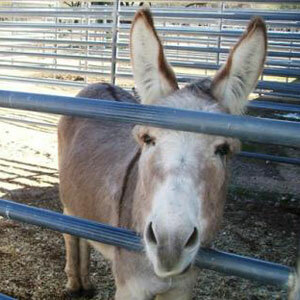 We occasionally get in donkeys that are young, healthy, adoptable & work to find homes for them. But our primary objective is to provide a sanctuary for those who have run out of options. As a private sanctuary, we are limited as to how many animals we can take in. 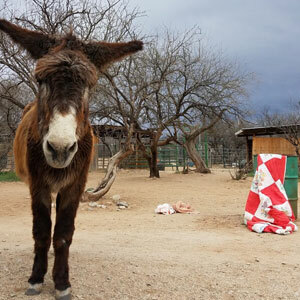 But I hope we never have to say no to a donkey who REALLY needs a home.